This week’s Parashah is called BO (Hebrew for “go” or “come”): Exodus 10:1 – 13:16. It includes the Passover section of Scripture. When I came to the part where the Israelites were instructed to wipe the blood of the lamb on the lintel and doorposts of their house, I tried to picture that in my mind. (I *am* a writer, after all.) One of the other things I’ve been trying to do is to learn Hebrew. (Very ambitious, I know.) Anyway, it came to me that the shape made by the blood on the doorposts was in the shape of the Hebrew letter “chet.” I thought that was pretty cool. One of the commentaries I read mentioned that very thing. After being all proud of myself for noticing it, I continued reading. 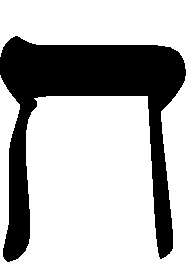 In the days before Hebrew had vowel markings, the letter “chet” spelled the word life. So, the blood (which is the life of the animal) is put on the doorposts of the house to indicate to the death angel that the people inside have been obedient in trusting God’s words and following his commands and are therefore the recipients of life. Likewise, our obedience to trust God’s words and follow His command to repent means that we have painted the doorposts of our hearts with the blood of our Passover Lamb which indicates that we are the recipients of life! My heart overflows with gratitude to the One who made life my eternity. This entry was posted in Abdicating the Throne and tagged Life, Parashah, Torah Portions.